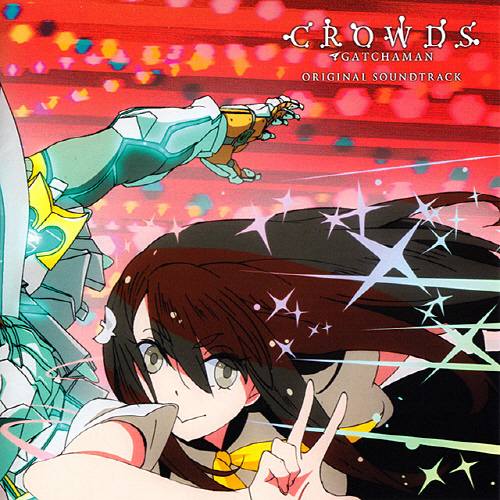 Review: Two factors in Gatchaman Crowds’ soundtrack make it an unlikely candidate to herald its composer’s return to quality form. First of all, Taku Iwasaki’s penchant for experimentation hasn’t been fruitful recently; I wasn’t too fond of his work on Jormungand’s soundtrack and even Iwasaki himself was displeased with the way his music was used in JoJo’s Bizarre Adventure. Secondly, genres like dubstep are an anathema to me seeing as how I find the grinds, wails, and blares to be generally obnoxious, unmemorable, and unappealing. But in Gatchaman Crowds, Iwasaki’s work defies such expectations. His experimental forays into dubstep and electronica, amazingly enough, fall under the tolerable end of the spectrum. If that wasn’t enough, the melodic tracks are a force to be reckoned with. It’s through this latter aspect of Gatchaman that we get a glimpse of the Taku Iwasaki of old; the Iwasaki who wowed us with immortal classics like the scores to Gin-iro no Kami no Agito and Rurouni Kenshin ~Tsuiokuhen~, the Iwasaki whose sweeping melodies tickled our senses, drawing us into the anime and rendering us captivated by the emotion and energy that flowed so effortlessly through his music. Having an energetic starter where the vocalist belts out an enthusiastic “G-G-G-G-G-Gatchamaaaaaaaaan” to grab your attention never hurts either! With that outburst, “Gotchaman ~ In the name of Love” gets underway. The pumping beat, synth channeling, and screeches and grinds are effective in setting the pace and tone for the piece, imbuing it with boundless energy to take our imaginations for a wild ride. Strings, electric guitar, and spoken word roll along effortlessly, punctuated by dubstep that, while harsh, isn’t wholly unpleasant as the excitement lingers to infect many of the subsequent tracks. Together, this blend is one of the better results from Iwasaki’s endless experimentations and certainly generates the right amount of intensity for the road ahead. And as the intensity weaves in and out, it picks up in “Firebird,” where the discordant tone, complete with typified dubstep stutters and blares bring about a sense of danger and havoc through a harsh tone cranked to maximum. Iwasaki even throws in a brief chiptune measure to give the piece a video game-y feel before launching back into a harrowing melody that oozes tension in a way that’s compelling even if it teeters upon being overbearing. More palatable is “Music goes on,” where the string introduction segues to a vocalist whose voice is compelling through her persistent exhortations. Furthermore, the lines of dubstep are well-executed as it hits all the right spots simply by limiting their harshness while setting a clear direction, thereby sounding less like cacophony and giving them a melodic quality. Finally, the strings succeed in elevating the overall grandiosity of the conflict and maintaining the sense of struggle every step of the way as the heroes seek to bring about a better world. Where Iwasaki’s experiments falter just a bit is when he tries to cram too many genres into one piece. Nowhere is that more evident than in “Ziel der Hydra” where we see orchestrals and opera (with longtime Iwasaki collaborator Yuri Kasahara) trying to mesh with dubstep. As bold and captivating as the piece is when it first starts, the electronica detracts from the other instruments’ fineries, preventing it from being the more polished effort it could have been. The most blaring example would be when the dubstep groans try to integrate with Kasahara’s operatic delivery around the middle, resulting in a messy rather than complementary affair. Nevertheless, the dramatic aura it gives off is sufficiently decent and even with its faults, still worth a listen. So even though the dubstep rules many of the pieces, Iwasaki dispenses with a notable track that departs from the intensity and urgency to cater more to the whimsical moments in the anime. “Tutu” is by far one of my favorites and I find myself entranced by its hypnotic tones which lull me into a pleasant dream. While the vocals, which float about with the seemingly aimless “I’m busy lalalala~,” draw most of the attention, you shouldn’t discount the instrumentals which envelopes you in its warm, endearing atmosphere of childish naivete, one that blossoms before receding back to its charming sleepiness. But the strongest tracks by far rely on Iwasaki’s skill in composing string and piano melodies. “Why I kissed him?” is one that stands out with regard to how poignant it is. The violin solo opens with a wistful tone that draws out a profound heartache, especially during the sustained notes which heighten the feelings of regret so as to worm its way into my heart. The resulting bittersweetness is touching and I find myself won over by the quiet desperation that seeps out of every measure. As melancholy as it is, the track does proffer a small helping of hope that things will turn out for the best. The piano that opens “Unbeatable Network” is also engaging as its motif exudes a growing optimism in the way it builds up, adding more instruments, before letting loose with a sweeping orchestral/chiptune mix that inspires much hope as people step up and strive forward in their dedication to bring about positive change. Finally, “Love” is a fitting ending, as the strings weave a melody seeped in quiet contentment, in a way that’s honest as the happiness comes across in a lovely fashion. Under no yardstick is Gatchaman Crowds Iwasaki’s best effort, but it’s certainly a big step up relative to his recent work. While the dubstep tracks vary in their quality, none trip across the line into obnoxiousness as they succeed in being fittingly intense and exciting. More importantly, Iwasaki’s orchestral pieces demonstrate his capacity to write compelling compositions that tug upon those heartstrings and captivate listeners with their beauty. The only regret, perhaps, is that there aren’t more of them. I’m one of those people that think the very first track is ruined by the 30 seconds of dubstep in the middle. This soundtrack had far too much electronic/dubstep mixed in for me to enjoy it as a whole. When I was listening to tracks like Ziel der Hydra I was wondering what Iwasaki was even thinking. “This is horrendous” I said. I’ll agree that it’s his best soundtrack since Katanagatari but that isn’t saying much, is it? It’s a step up, sure, but when you’re at the bottom there’s no where to go but up. The few orchestral/strings pieces at least serve as a reminder that Iwasaki hasn’t lost his talent, he’s just decided to hide it away for now. It’s a pity, really. As a decidedly non-fan of dubstep, Iwasaki’s efforts are better than most of the crap that others have shown me and that alone is worth many plaudits. Also, this album gets the props for not being boring; if there’s something that his other works lacked, it was the ability to engage and excite me. Gatchaman Crowds does that and a good amount more! Sure, but doesn’t the dubstep feel out of place? It’s like when you’re listening to the full version of some anime song and a guitar solo comes out of nowhere. You’re only left thinking the song would have been better off without it. I can see what you’re saying. The underlying music is good and I was excited by the orchestral music. I’m just not a fan of all the stuff layered on top of it. I should probably note that I don’t have anything against experimenting with electronics and such. I just don’t think Iwasaki does it as well as others. At the very least I can say this soundtrack gives off a glimmer of hope. Though I’m still pretty pessimistic. Hmm, and it looks like his next show just got announced. Noragami, the fantasy/action series from Bones that will be airing in January. We’ll see. I generally agree with you in that Gatchaman is “returned to form” partly because where he did experiment, it came out pretty good. The rest is kind of typical of him. As for people’s tastes, that’s something people have to deal with. I enjoyed most of this one! Per my response to random, this was engaging and enjoyable on the whole, with a few messy tracks that don’t really detract from the overall experience. With that said, I wouldn’t mind more “typical” Iwasaki fare, mostly because “typical” Iwasaki isn’t nearly typical enough. I kinda miss that, actually.